Take advantage of our free computers, industrial strength WiFi throughout the WHOLE building (yes, really! ), free breakfast, free all-day tea/coffee, clean spacious rooms, secure bike storage, laundry service, cool communal areas with lots of character, strong hot showers, comfortable beds, and possibly the most well-equipped self-catering kitchen you'll find in a hostel anywhere! We've got the space and equipment for groups of up to 50 to cook and eat together, so gone are the days of waiting your turn for the only working stove-top. We keep a nice range of spices, oils and garnishes all year round so you can take your meals from bland to beautiful with no extra expense! Our colourful lounge has loads of comfy sofas, a free book exchange, a pool table and foosball; the perfect place to unwind with a dram of whisky after a day exploring, or share a beer with new friends (or old friends over Skype!). There's NO CURFEW - you'll have your own keys to come and go as you please. And the rooms? SPACIOUS. The solid bunks are wide and high enough to store two sets of luggage underneath so even full rooms aren't cluttered. The beds are built-in and solid (no creaking and squeaking here!) and each has its own reading light and double socket to recharge your gadgets overnight - no more fighting with your room mates over the one and only outlet in the corridor! Bring your own padlock if you want the extra security of the individual lockers we have under each bunk. 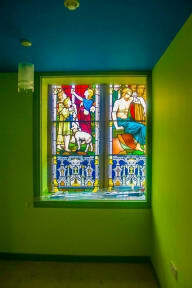 Visit Scotland has rated the cleanliness of our Hostel at a stunning 96 out of a possible 100 points. Our whole hostel is cleaned every day and your bed will be made up ready for you to check in. Big fluffy towels are available to hire from reception. We have plenty of bathroom space too, with separate facilities for male and female guests (so we can all keep a bit of mystery)! Our central location is within a ten minute stroll of the bus and train station, fish and chips, convenience store, the sea front, pubs and cafes. We also offer private rooms in our neighbouring guest houses (twins, doubles, family rooms - some of them ensuite! ), all with a flat-screen TV and the same free WiFi and free breakfast that our dorm-dwellers enjoy. We don't have on-site parking, but there is parking on the street (free over night) & free parking at the leisure centre just up the road form the hostel. 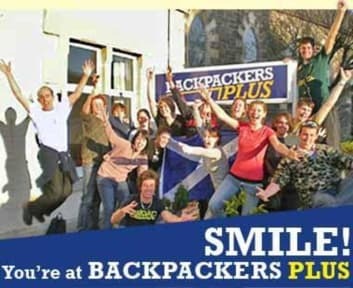 We look forward to welcoming you to Backpackers Plus in the Old Church! Maximum nights stay is 7 nights. Excellent staff service! Great equipped kitchen. Thanks for the free breakfast. I will come back one of these days!